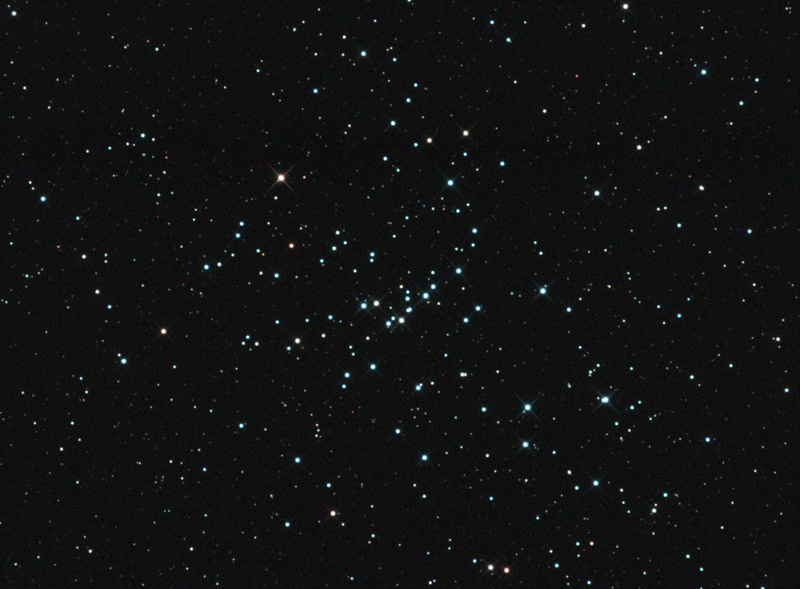 Adrian Brown captured this image of M48 in February 2012. He comments: "It's another photograph with my Skywatcher 80EDPro refractor and ATK16HR camera but, as an experiment, I attached two crossed solder wires, painted matt black, across the front of the refractor's dewshield to produce some diffraction spikes on the brighter stars. I've always liked open cluster photographs with diffraction spikes and I quite liked the effect of the wire mask although tinkering like this and adding artifical elements will probably upset the purists in the hobby!" The photograph is comprised of 8 x 2 minutes Red, 6 x 2 minutes Green and 6 x 2 minutes Blue with Astronomik RGB and CLS light pollution filters.